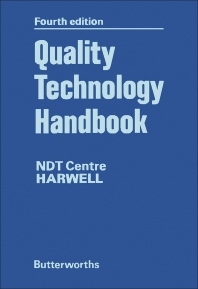 Quality Technology Handbook, Fourth Edition offers a wide discussion on technology and its related subtopics. After giving some information on its background, content, and authors, the book then informs the readers about the quality problem check-list and enumerates the questions one has to ask to ensure that a problem will be solved. This part is followed by a discussion on non-destructive testing (NDT) and the several committees formed for it, among which are the British National Committee and the Harwell NDT Center. The book also includes information on two organizations that are closely related to the topic, the Institute of Quality Assurance (IQA) and The Welding Institute (TWI). A directory of international organizations related to quality assurance and non-destructive testing is provided in the latter part of the text. The book serves as valuable reference to undergraduates or postgraduates of courses that are related to science and technology.